Of all the things Jesus said, one-fifth was about money and possessions. There are over 2000 verses in the Bible about money, possessions and finances. That’s three times more than the subject of love and seven times more than the subject of prayer. 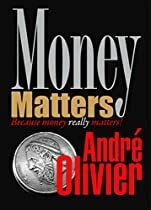 Money is an important matter in the Bible because money really matters. •	A helpful book for a better biblical understanding of making and using money. •	Learn how we can have plenty of money, and yet be totally free of its power over us. •	Understand the power that money gives us to radically change our world. •	Discover the amazing characteristics of givers, and why people are so drawn to them.